Over the past decade the United States government has gently introduced a string of overriding rulings from the Supreme Court to over throw the wishes of individual states to uphold and enforce not only their local elected laws, but the United States Constitutional guarantees to the people. Each year this blatant abuse of power grows ever stronger as the citizens grow ever accepting of this tyrannical disembowelment of our civil rights. The officials no longer represent the people. The people are increasingly distracted by television, sports, and the evaporating savings accounts that keep their bills paid. As Wall Street is being “occupied” by a rising collection of infiltrating co-opted mercenaries, states are being denied their right to protect their lands with simple laws that violate no Constitutional guarantees. The Supreme Court, who is governed not by the Constitution, but the bylaws of the UNITED STATES OF AMERICA CORPORATION who reside in their sovereign country of Washington D.C., shamelessly are dismantling the country one ruling at a time. It is important that once America is freed from its financial captors of Europe that it strip the Supreme Court of its un-Constitutional power and be replaced by a faction of individual certified to not only live within the Constitutional law, but to rule exclusive from within its paradigm. If you’re serving on the Supreme Court you have a narrow window of opportunity to shift power back to the states and thus sanitize your voting record before the people decide in a court of law whether you acted as friend or foe. As citizens of any state, you need to raise the level of conversation about such rulings from the Federal level. 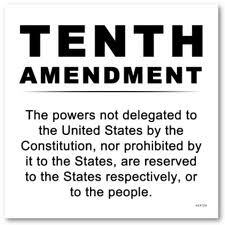 The Federal government should merely be a tiny body of legislators that facilitate the laws of the states. As each state recaptures its individual culture as allowed by the Constitution, America will become a uniquely interesting powerhouse of thinkers that will push our dear country back to the top of all innovation and prosperity.